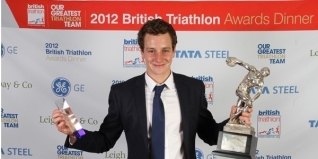 Alistair Brownlee and Helen Jenkins have been recognised for their outstanding achievements during 2012 at British Triathlon’s Annual Awards Ceremony at the National Motorcycle Museum in Birmingham. Olympic Champion, Brownlee, was awarded the Olympic Athlete of the Year Award and GE British Triathlon Male Elite Triathlete of the Year for the fifth successive year. Meanwhile, Jenkins was recognised for the best ever Olympic finish by a British woman following her fifth place finish at the London 2012 Olympic Games. In what has been Britain’s most successful ever year in the sport, the men’s Olympic Triathlon Team of Alistair Brownlee, Jonathan Brownlee and Stuart Hayes collected the prestigious Peter Holmes Award for Inspirational Performance in International Competition. Alistair Brownlee delighted hundreds of thousands in Hyde Park, and inspired millions more with his dominant gold medal-winning performance this summer. On an evening designed to celebrate outstanding success, over 400 guests stood to recognise the Olympic Champion and triathlon’s six Olympians. Jenkins finished fifth in the dramatic London 2012 women’s race that resulted in a photo finish between Switzerland’s Nicola Spirig and Sweden’s Lisa Norden. She was awarded the GE British Triathlon Female Elite Triathlete of the Year award, which also recognised her winning performance at the ITU World Triathlon San Diego. 2012 has seen exceptional success for British triathletes with Jonathan Brownlee claiming the ITU world title last month. Non Stanford became the ITU U23 world champion and Leanda Cave was crowned Ironman world champion in Hawaii. In addition, Britain has five ITU Paratriathlon World Champions. GE Great Britain Age Group Teams continue to dominate in international competition around the world, and participation in triathlon continues to boom.